Nathan Hill reviews this new book by Mark Denaro and Rachel O'Leary. This book fills a niche that has been vacant for way too long. Plenty of folks have nano tanks these days, while huge numbers of retailers still supply fish that outgrow them. Many people lack inspiration for a smaller system, going down the unimaginative route of a handful of guppies, or a single, morose fighter. This book aims to expand the horizons a bit. 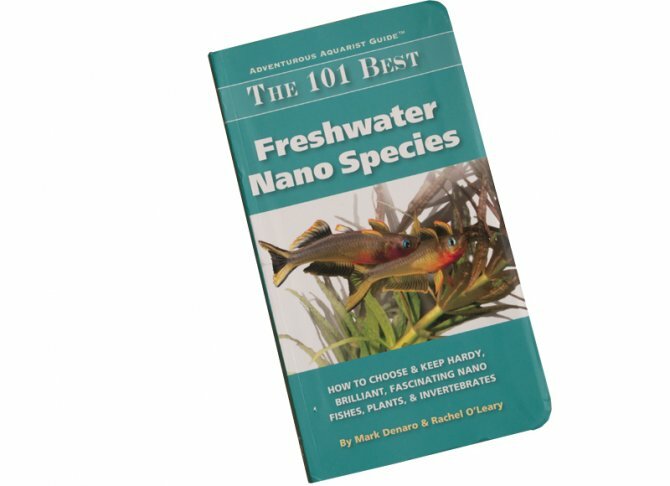 Primarily, the book is a handy (big) pocket sized guide, teeming with species suitable for smaller set ups. A new aquarist can wander the aisles of their local stores, stumble across something they like the look of, cross reference it and check for suitability. Or you can be old school, and make up a shopping list way in advance, based on what the book suggests. The species are chopped up between fish (mostly), plants and inverts suited for smaller accommodation. Each comes with a species overview, a native range (for the biotope minded), maximum size, a minimum recommended aquarium size, desirable water parameters, feeding advice, and behaviour and care notes. In the case of plants, lighting and propagation notes are included. Being American in origin, the definition of 'nano' differs slightly from our own UK interpretation, and the fish included are chosen for suitability in tanks of under 20 US gal (76 l), meaning there are some species like Upside down cats and Kribensis that might seem less ‘nano’ than they first appear. But on the whole, the selection is admirable, tossing up a few species that are less usual, like Hara and Nannoptopoma catfish. Note also that a couple are not permissible in UK, such as the Cambarellus crayfish. As well as covering profiles, the first segments of the book cover nano tank husbandry, feeding, and even a few suggested biotope and stocking layouts. For a small subject, the authors manage to pack 192 information-heavy pages, and cover a lot of ground. Livestock buyers should get a copy to plug any gaps in their stocking, and increase their nano-friendly range, while hobbyists should consider it a valuable point of reference for all things small. I imagine my own copy will be getting well thumbed this coming year. Price: £12.51 print, £6.64 Kindle (Amazon prices).